AUTO [V] Shinken Hissatsu: During your turn, when your G-Unit Strides, choose up to 3 of your units, and they get Power +3000 until end of turn. AUTO: [CB1, SB1] When this unit is placed on V, you may pay the cost. If you do, look at the top 7 cards of your deck, search for up to 1 <Touken Danshi – Tachi> from among them, show it to your opponent, add it to your hand, and shuffle your deck. AUTO [R] Shinken Hissatsu: [CB1] When this unit attacks a vanguard, you may pay the cost. If you do, this unit gets Power +3000 until end of battle, and at the end of that battle, if this attack did not hit, draw 1 card. CONT [R]: This unit cannot be chosen by your opponent’s card effects. AUTO [R] Shinken Hissatsu: [CB1] When this unit boosts a unit with the Shinken Hissatsu ability, you may pay the cost. If you do, this unit gets Power +4000 until end of battle. 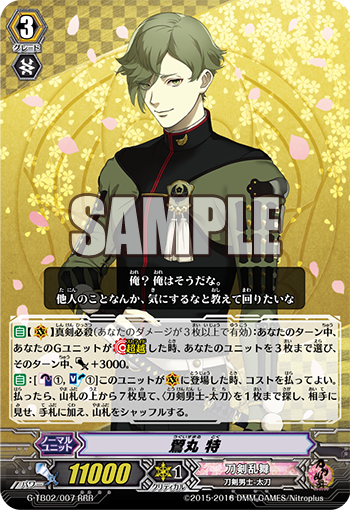 “Uguisumaru Toku”, if you’ve achieved 【Shinken Hissatsu(Activates when you have 3 or more damage)】 and you Stride this card, for no cost, you can Power Up 3 allies’ Power by 3000! Simply put, you’ll be able to increase your Power enough to attack the opponent’s Vanguard, meaning you’ll be able to deal a ton of damage. And when you Ride it, you can look at the top 7 cards of your Deck for a 〈Touken Danshi – Tachi〉 to add to your hand. Good options for this are a Grade 3 to pay for Stride, the “Sentinel” “Kousetsu Samonji” or the Critical Trigger “Shokudaikiri Mitsutada”. Continuing with our introductions is “Shishiou Toku”, when it attacks a Vanguard and you’ve achieved 【Shinken Hissatsu】, you can Counter Blade 1 Card to increase its Power by 3000! And if its attack hits, you can draw 1 ccard. For your opponent, they’ll be forced to decide between Guarding or to let you potentially draw a troublesome Unit. With this card, it’s possible to push your opponent into a position of distress! And, because it can’t be chosen as a target by your opponent’s effects, it has the favorable point of being reliable against Retire and Lock effects. “Yagen Toushirou Toku” is a 【Shinken Hissatsu】 support, in that when it boosts a Unit with 【Shinken Hissatsu】, can increase its own power by 4000. If you add it into a Deck with a ton of Units with 【Shinken Hissatsu】, allowing you to activate its effect every turn. We’re also revealing special illustrations being drawn just for the occasion, to help you get excited for “Touken Ranbu -ONLINE- 2”! So pay attention to future information!